A ninth grade mathematics main lesson book. At first glance, a mathematical journey through the grades at the Rudolf Steiner School of Ann Arbor seems like a study in opposites. At one end of the numerical spectrum, first, second, and third graders are drawing pictures of “number gnomes” and learning their times tables through rhythmic games and verses. Written work is so gently introduced that they do not even encounter their first math quiz until fourth grade. On the other hand, high school students are mastering the rigors of Projective Geometry, Algebra II, and Calculus. One of last year’s graduates, gifted in math, completed Advanced Calculus her junior year under the tutelage of teacher Janis Stipins (using his freshman textbook from M.I. T.) and did an independent study in Abstract Algebra as a senior. She is now studying at the University of Chicago, one of the top math programs in the country. “The school really ought to let parents of younger children know what’s coming,” high school parent Denise Wilson said in a recent conversation about her children’s experiences at RSSAA. Her daughter, Alexa Cowing, is a senior who missed only two questions on the math section of the SAT, and her son Spike, a sophomore, is a “techie” who enjoys computer programming. But indeed, counting acorns and gemstones in first grade really does lead to the concept of infinity in high school. Is there a paradox here? According to Geoff Robb, who heads the math and science departments, there is no paradox — just a thorough understanding of the stages of child development. That step includes material familiar to parents schooled in fractions, decimals, and percents. Then, there is business math, during which sixth graders create and run their own businesses (a pumpkin sale and weekly bake sales in the case of this year’s entrepreneurs). By seventh grade, math classes are tracked, for greater personal attention according to student needs. Careful drawings help students understand geometric solids inside out. RSSAA high school students take the standard array of college prep classes by the time they graduate: Algebra I and II, Geometry, Pre-calculus, and Calculus. In addition, there are “main lesson” courses that run for two or three weeks. These classes introduce real-world math applications and place mathematical discoveries in a historical and cultural context. They include Conic Sections; Series, Spirals, and Progressions; Trigonometry; Surveying; Projective Geometry; Celestial Navigation; and Advanced Topics in Math. The material is demanding. One junior who transferred in the high school this year found herself a bit overwhelmed by the four hours of daily math initially scheduled for 11th graders. 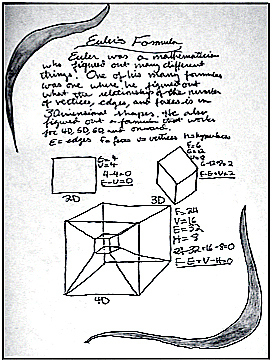 This included an hour of Euclidean Geometry, two hours of Projective Geometry, and one hour of Computer Architecture (a math-based computer course). Still, conversations with high school students reveal a high level of satisfaction with math. The atmosphere in the classes is colorful, said senior John Burnett, expressing a sentiment echoed by peers, including his sister, Laura, a 10th grader who says math is her favorite subject. “Mr. Robb and Mr. Stipins crack jokes and tell stories, so you pay attention. Also, the teachers are really helpful. If you have trouble, you can ask them at lunch, and they’ll go through it with you, step by step.